This was my first week back to college after our long Christmas break, and I'm finding the stress and workload familiar yet draining. 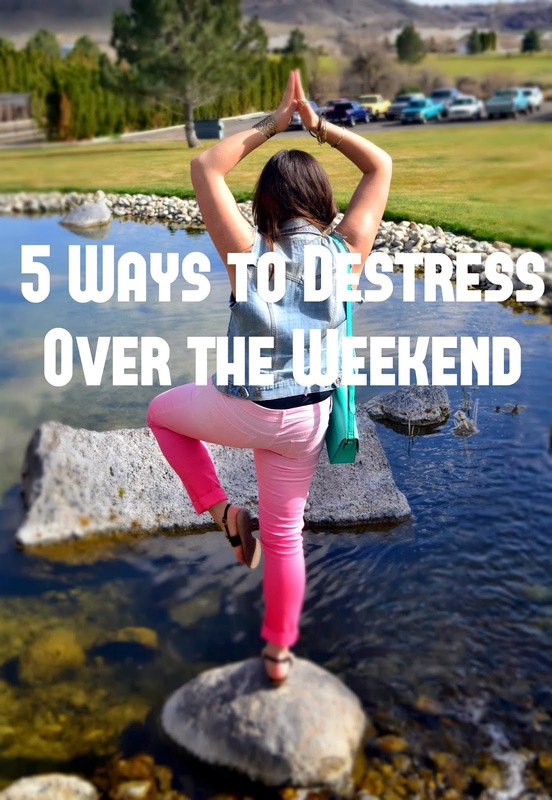 So in hopes of helping not only myself, but hopefully all of you, I'm sharing some tips on what to do this weekend to destress and recharge for the next week! Believe me, I know how tough this may be, but to completely remove yourself from our hectic, digital world, if only for a few hours, will not kill you. Turn off the phone, stay off your laptop, and try to be present in reality instead. When was the last time you read a book for the sheer enjoyment of it? It's been too long for me! Even if you're not the bookworm type (which, I have to say if you're not, I feel sorry for you), flip through a photo heavy book that may be lying on your coffee table. Read the captions and learn something new! You know what I mean - break out the nail polish and pedicure set! It's time to give yourself some treatment time. You can also use a nice face mask to rejuvinate your tired skin. If you've got some leftover candy canes from the holiday season, try making this yummy scrub! Since Pinterest is constantly adding new recipes, there are always tons of fresh new ideas of what kind of treats to make. Plus, you can go in so many different directions - if you're sticking to your New Year's resolution, you can easily find a healthy alternative for everything! Hey, the power of endorphins is awesome! I highly recommend Zumba, Yoga, or Pilates. These workout trends are a fun and engaging way to get some exercise in, and once you finish, you'll feel so accomplished! (If you're stressing out over a procrastinated homework assignment, the only way to feel better is to get it done and over with - and then commence with the above list). love these ideas! I absolutely love the evenings where I turn off all technology and just read for hours. So nice to not have to worry about anything for a while! I definitely plan on painting my nails and reading. These things are musts! But I'm too in love with the internet to shut off for too long! Plus, on the weekends is when I get most of my "I'll read/do this later" pile sorted through. These are GREAT tips though! Great list! I love putting a mask on, lying in bed, and watching a movie or TV show. Yes and Yes to all of these, i fully agree with taking a break form technology, I did that on my mini holiday last week and it was so peaceful. Love the idea of baking too, i find it really therapeutic. Have an enjoyable weekend dear Linda! Baking helps me - a lot. So does reading. I really should do more yoga because I always feel so much better after a class. The tech thing! Eeek! I know I should but it's so impossible sometimes! I'm bad, I know! These are all great ideas. I work a lot and I find it hard to unwind on my one day off. Laying in the sun and reading a book is my new favourite thing to do. How dare you suggest I turn off my technology! :p I should really take heed to that advice though, since I will be starting class soon as well. Nice post! if only I read it during my exams- may have helped. Stellar post, missy. I agree with taking a break from technology -- even though it's hard for me because my phone is attached to my hand, I know that when I take a break from the internet world I get more done. Being the veg-head that I am, I am constantly baking things from scratch with substitutions in them. I just made Black Bean Brownies tonight, actually. They are amazing and full of protein! always detaching from the internet is a great way to destress.. i just find that my mind and body gets cluttered by information/social media overload when I'm on the net 24/7. This is so helpful! It is so true how most of us just stay on our phones too much now-a-days! I went to a dinner the other day and everyone was on their phones and it was silent - what has this turned into?! I also love reading yet haven't done enough recently! Thank you for the great tips and this time of year, the stress just burdens down on us - and the weather doesn't help! Great ideas! Reading a book is totally my trick! Yay I did all except for no.4, but I think I will do that tomorrow. Hope you've had a relaxing weekend yourself. Hah, I was going to say dude-whats up with all the lovely green-ess down there! Now I just want summer to come even more.:). I love the last little bit, the best way to get something done is to just do it. I hope all's going well with the new semester and all. So with you on these! Time to recharge for the week ahead! I enjoyed reading your thoughts on my last post, thank you! As much as I love to blog I have also learned that I love to have time away, esp on the weekends. These are all such good ideas, Linda. You make me want to do all of them right now! haha But really, thank you so much for the body scrub recipe. I have so many candy canes left over from Xmas that I can't bear to throw out, so this will be a perfect way to put them to good use! Wonderful tips and ideas. This will definitely come in handy with all the wedding planning. Thanks for sharing girl! I love weekends. I think I appreciate them even more after having worked in retail for so long, I had no idea everyone was doing all this fun weekend stuff while I was working! our favourite things to do are going out for a lovely weekend breakfast or spending the afternoon at an outdoor bar. Thanks for sharing this!!! i'll bookmark this definitely!! !